Air Zermatt AG; substantially damaged in an accident after the pilot lost control in white-out conditions whilst on a ski-lift flight and the helicopter crashed into a glacier at Rothsrugletsher, Rothorn, Valais, 3560 m; pilot and two passengers seriously injured and one further person lightly injured. 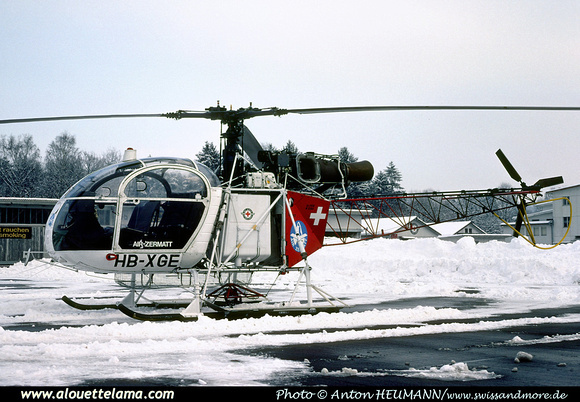 Air Zermatt AG; crashed whilst engaged in sling load operation when helicopter collided with a telephone line. The pilot suffered only minor injuries but helicopter was destroyed. 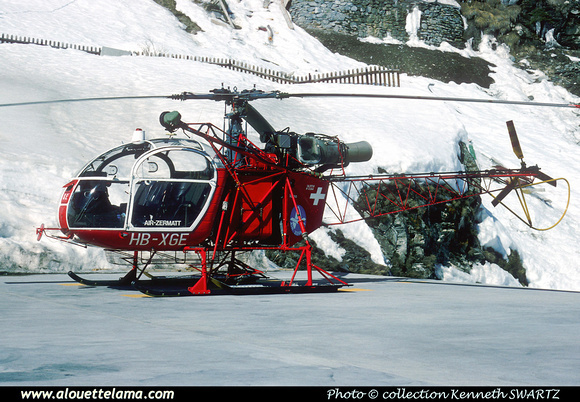 HB-XGE Eurocopter (Aérospatiale) SA315B Lama MSN 2284, Air Zermatt - Bern-Belp - LSZB - 29-12-1976 - Photo Anton Heuman, Kenneth Swartz collection. HB-XGE Eurocopter (Aérospatiale) SA315B Lama MSN 2284, Air Zermatt - Zermatt - LSEZ - 03-1980 - Photo Kenneth Swartz collection.